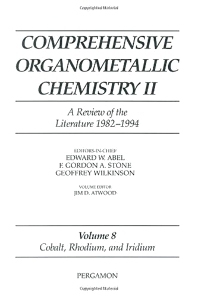 This volume covers the advances of organometallic chemistry of cobalt, rhodium and iridium from 1982 to 1993 with over 3,000 references not previously included in COMC. It incorporates recent developments including carbon-hydrogen activation systems and C60 and C70 complexes that have been discovered since the original publication of COMC. Cobalt (R. Sweaney). Rhodium (P. Sharp). Iridium (J. Atwood). Cluster Complexes of Cobalt, Rhodium and Indium (C. Barnes).